I like to poll my followers on instagram often. why? well one, people love taking polls, or at least I do and two, bc I want to know what my followers like and want from my feed/blog so instead of guessing, I just ask! so in a recent poll, you all wanted to see the items that got the most love in May – and by “got the most love” I mean, most purchased. back story: in case you weren’t aware, I’m a part of the rewardstyle network and when you buy something thru my links, I receive a small commission for the work I do. you might be thinking, “work? 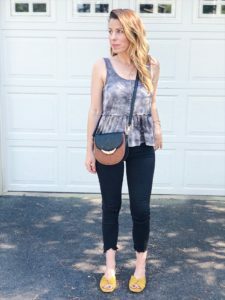 she just takes pics of her outfits” well, its much more than that and every little purchase you make not only helps to keep this blog going by helping to purchase more items to share with you guys, but it also helps our family. so no matter how silly it may seem, this is my job and I love it and I’m extremely thankful to every single one of you when you decide to buy something I’ve recommended, so THANK YOU! 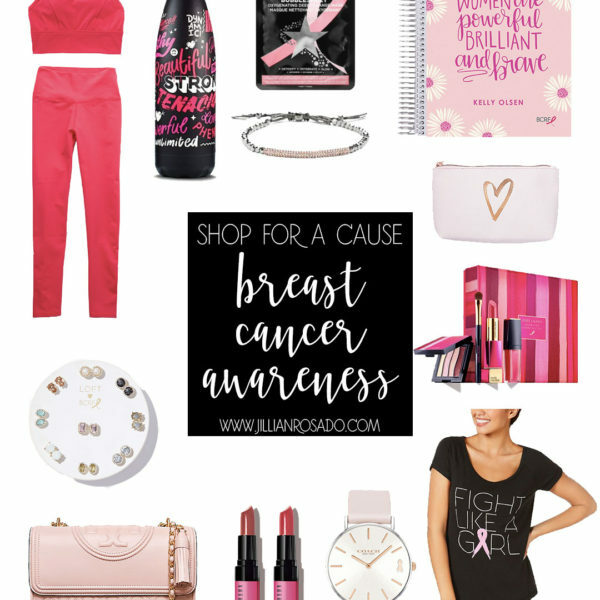 ok so back to rewardstyle: one of the benefits of being a member is they keep track of how many times someone clicks on one of my links, purchases thru one of my links, etc, soooo I’m able to share the most-loved and self-proclaimed “must haves” with you! while shopping for our Miami trip (that I need to really start packing for being that we leave tomorrow! ), I was striking out with everything I tried on so I gave up and starting looking at shoes. 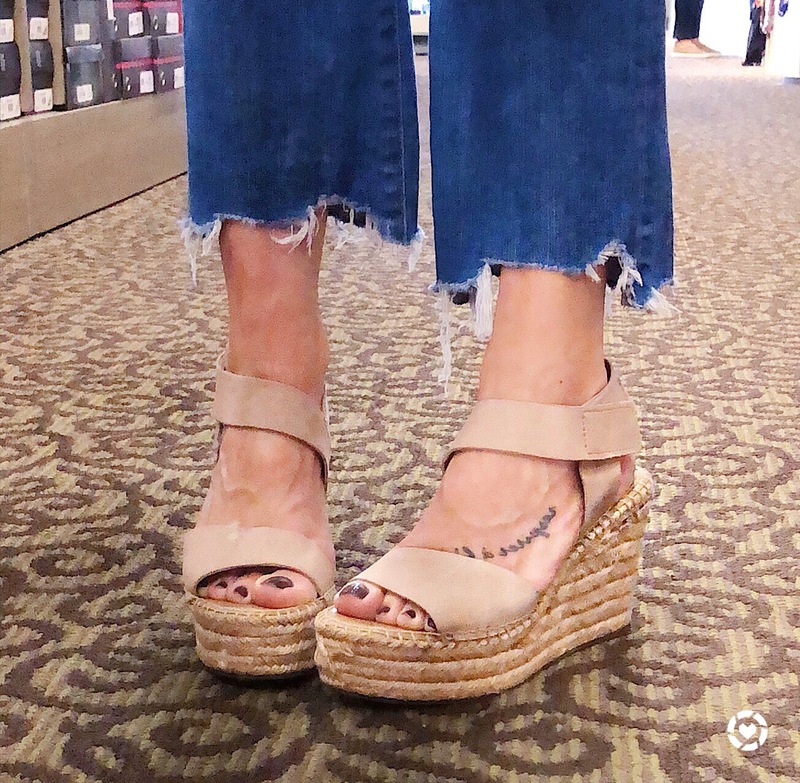 Well you gals went NUTS over these! Seriously, I never received SO many DMs before until I shared this pic in my Instastory! They are super comfy, come in 4 colors (I’m wearing the blush) and fit TTS. I highly, highly, highly recommend them and am always so glad when you send me pics in yours! ps: the jeans I’m wearing in the pic can be found HERE bc I got a handful of questions about them too! apparently I have good taste in shoes?? 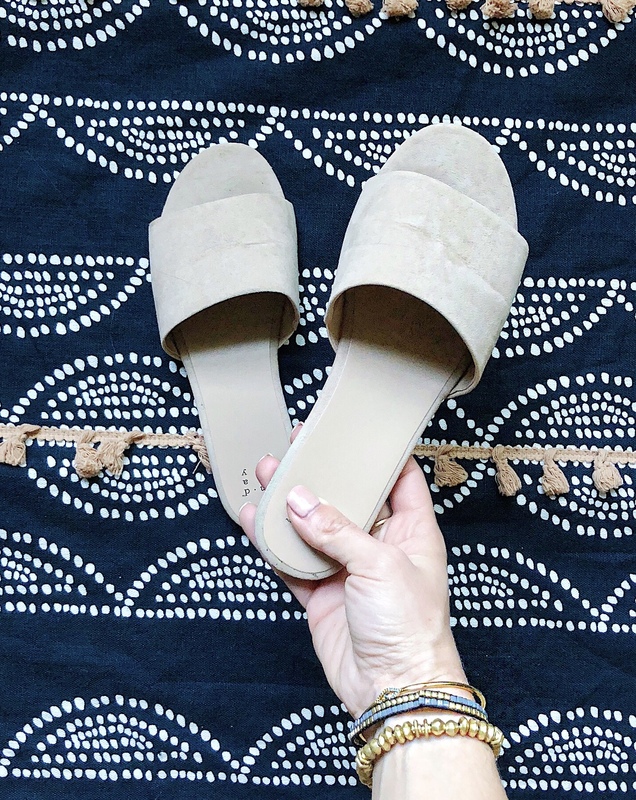 I love shoes and love a deal on shoes, so these slides were a HUGE hit – I mean, how can they not be for $12.99?? they come in like six different colors now too so I may have to grab a few more pairs! this neutral color goes with everything tho, just slide them on and go! 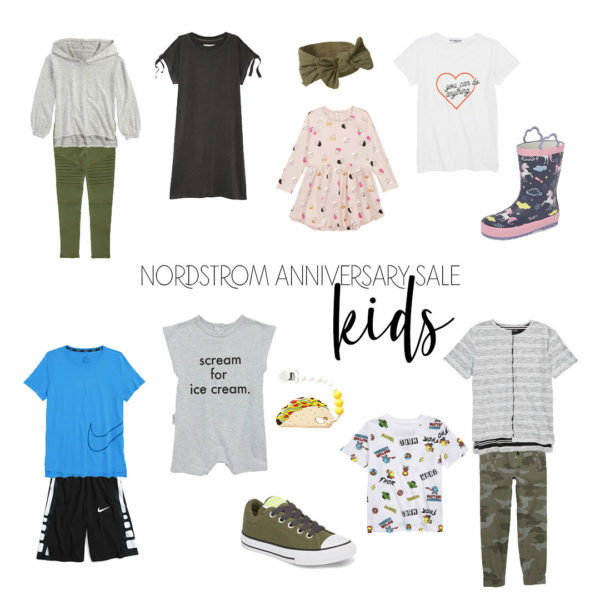 and are currently buy one, get one 50% off online only! 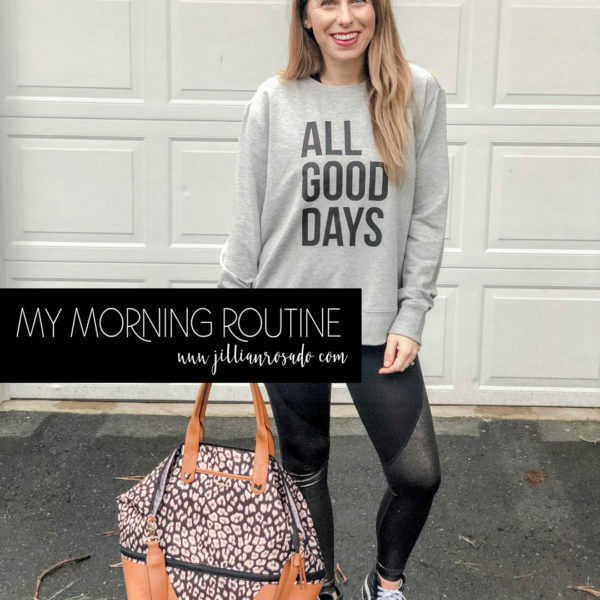 this dress is the easiest throw on and go look and if you’ve been following me for awhile, I am all about easy style! this was selling out so fast, but lucky for you, they just restocked this charcoal gray and the black in all sizes. it also comes in light gray, but sizes are limited in that one. this dress fits TTS (I’m wearing a small), has pockets and… well it has pockets so do I need to go on? kidding! you can wear a normal bra with it, its cotton and yeah, you get the point. no brainer, get the dang dress! 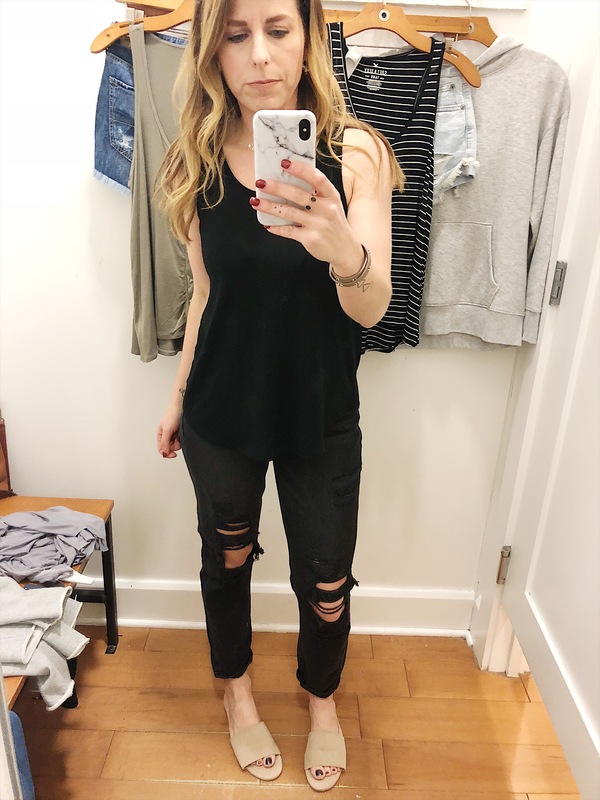 I love a simple black tank and while you continue going thru this list, you’ll see that apparently all of you do too! this one comes in quite a few colors, but you can’t go wrong with black! its scoop neck without showing off all the goods, your bra won’t peek out the sides and its only $10 – score! I’m wearing a small here for a slightly loose fit. this one was a super favorite for me honestly! 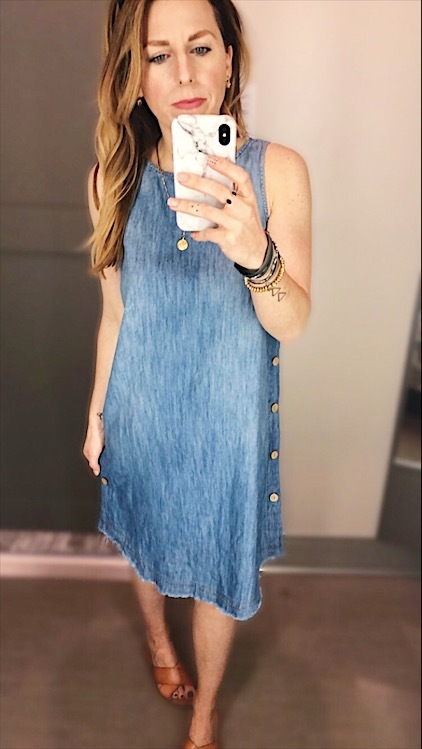 I like a simple denim dress, but you guys REALLY loved this one! 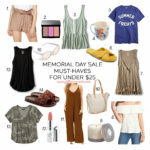 I guess when I really think about it, why wouldn’t a simple dress that you could wear year round for under $25 not be a big hit?!! duh Jill… so yeah, this dress, you gals loved it and I think I may have to go back and grab it after all! I would recommend sizing down in this as I’m wearing an XS here and its a little big. 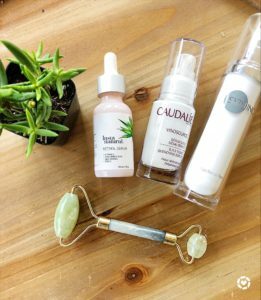 this jade roller – under $10! 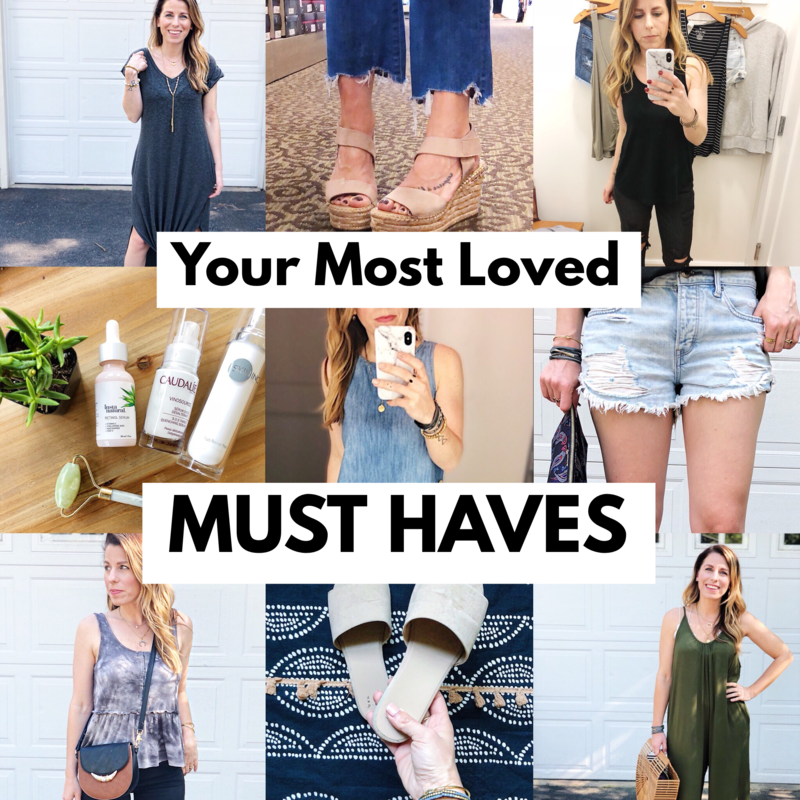 so those are your most-loved must haves from last month! there were a few more, but you guys loved them so much that they’re no longer available – womp, womp, wooooomp! are sitting there reading this thinking, how the heck do I find out where you got these? I love sharing what I’m loving with you guys, so I try to make it as easy as possible for you to get in on the fun! 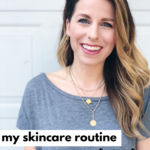 my skincare routine – updated!